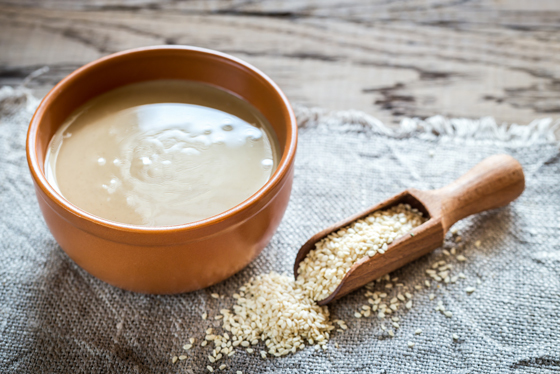 Tahini is an unprocessed paste made from sesame seeds. It’s extremely popular in Balkan, Middle Eastern, and many other ethnic cuisines. On its own, tahini is used as a spread on breads and pita, or similar baked goods. On top of tahini and bread, you can try drizzling honey, jam or flavoured syrup to make a sweet and savoury treat. Of course, hummus is the most common place you’d find tahini. Blending chickpeas and tahini with spices creates something rather magical. Hummus has really taken off in recent years as a popular spread, and I can see why. The varieties you can create really show how versatile the spread and dip can be and they’re just too many to list here. One of my favourites is our Hemp Hummus that we make in our Choices deli. Sesame seeds have a high oil content, so they add fat (and therefore flavour) to any food that you add them to. That’s why tahini is so useful to emulsify dressings, soups and sauces. Ever heard of tahino soup? If it wasn’t obvious, it gets its name from our subject spread. If you’ve never heard of it, tahino soup is a classic Greek dish that is quick to make, super healthy, and vegan to boot. Tahini is also found in that other popular Mediterranean dip, tzatziki. So what are some other ways that you can get some more tahini in your life? Why not try drizzling tahini on your favourite squash? Butternut, delicate or spaghetti squash are just a few favourites. Drizzle tahini over the squash and bake it just like you always do. Sautéed or wilted greens get a little more magical when you add tahini. Toss up some kale, collards, Swiss chard or other greens with some tahini, lemon juice and garlic and you have yourself an amazing side dish. Tahini is a magic sauce that can be used in so many ways. From your appetizers, to soup,to salad dressings, to rice and noodle dishes, to veggies and stire fries with meat, fish or tofu, tahini makes it tasty. It’s even good in desserts, like ice creams, bars and squares, and sweet toppings. Not many ingredients can say that, can they?